Speaking of problems that too much theological education creates: our household is having some difficulty getting our story straight on Christmas. It’s important to understand that I have been self-diagnosed with hyperaletheiality, a condition which makes it psychologically painful for me to knowingly deceive my children. And while I am a huge fan of imaginative play and happy to be a dinosaur, pirate or alien, it crosses a line for me to tell my kids that their presents are actually from an old man who lives in the North Pole. The line between imagination and reality gets blurred, and I move from joining my child’s pretend world to creating a deception. 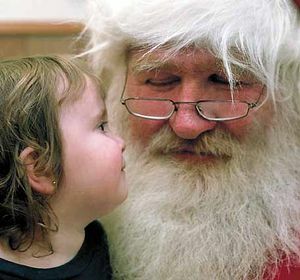 Naively, I thought that it would be relatively simple to sideline Santa Claus. My plan was to tell the kids that we give gifts to each other to remember the gifts that were brought to Jesus as a child, and because God wants us to be generous and to share with each other. Easy peasy, that’s Christmas at the Cowell house. The problem is that my daughter is now four. And she’s talking to other kids, who are all excited about Santa. And the Hollywood-North Pole alliance is killing us. You’d almost have to cut her off from all kids’ shows this month to avoid her seeing one that strongly emphasizes how important it is to believe that Santa is real. Isn’t that the last act of every single Santa movie? Christmas was almost ruined, but then people believed in Santa again! The kid heard the jingle bell ring! The reindeer were able to fly over Central Park! Just believe! I don’t think I’ve ever seen a film that pushes belief in Jesus as hard as the Polar Express pushes belief in Santa. This is an development I hadn’t anticipated. Now we can’t just ignore Santa and do our own thing. We have to take some kind of a stand. I was put on the spot by the question and wasn’t willing to just say “yes,” (and a simple “no” wouldn’t have worked either!) So we had a little conversation in which I told her that a long, long time ago there was a person named Nicholas, and he loved God and cared about other people, so he gave good gifts to families that couldn’t afford to buy nice things. He was such a good man that people have told stories about him for hundreds and hundreds of years, but in different parts of the world they called him different names. Now, a lot of people call him Santa Claus. But there isn’t just one Santa Claus, there are thousands and thousands of people who do the same thing that Nicholas did: they take the extra things and money they have and give them to people who need them. So this Christmas, Mommy and Daddy and Grammy and Grandaddy and Uncle Kasey will be Santa Claus for her, and also for some poorer families who need our help. It’s our turn to do what Nicholas did. I admit, this is all a bit much for a four-year-old, even the world’s brightest four-year-old, which is what we’re dealing with here, but I did manage to avoid pointing out that the modern conception of Santa Claus is largely the creation of the Coca-Cola company, and is basically an advertising gimmick which has further been co-opted and twisted for the benefit of the entire capitalist world and the aforementioned Hollywood-North Pole complex. Sure, I’m a compulsive truth-teller, but some things are just to horrible to expose to the innocents. And then I ordered Saint Nicholas: The Real Story of the Christmas Legend, which I hope will help us navigate this conversation next time. I was deeply disturbed when I first saw the studies that indicated that having a preacher/pastor with seminar training (M.Div. or more) was correlated negatively with church growth. Since I had finished my M.Div. nearly a decade before and was finishing up my D.Min. this was not good news. Of course, that was based on large trends that did not predict the outcome for any individual or church. Still, it was not encouraging. I asked myself why advanced training in ministry would not be correlated with church growth. It seemed counter-intuitive. Wouldn’t the most educated be the most skilled? Wouldn’t the most skilled be the most successful? 1) Educated pastors will be less comfortable delivering popular messages that depend on simplistic readings of scripture. At the last church we visited, we received a welcome letter from the pastor in which he told us that his favorite verse is Jeremiah 29:11 “For I know the plans I have for you,” declares the LORD, “plans to prosper you and not to harm you, plans to give you hope and a future.” He went on to say that he believed that God had brought us to that church for a reason, and that it was all part of the wonderful plan that God had for our life. At no point did he bother to mention that his favorite verse is from a letter that Jeremiah wrote to exiles in Babylon who had seen their county overrun by the enemy army, their leaders killed or shackled, their temple ransacked, their palace burned and their friends and loved one die from starvation or sword. They are now going to live the rest of their lives in a ghetto in enemy territory. When God says he has plans for them that include hope and a future: (a) that’s a message specifically for the Babylonian exiles, not for any random person who reads the letter in the future, (b) it basically means that things won’t get worse than they already are, that they’ll continue to eat and live, and someday their descendants will be able to go home to the ruins, (c) it was sent to them by a prophet who was repeatedly abused and left for dead, and was eventually carted off to Egypt against his will. People want to be told that it’s all simple, and the their life will be good (in the way that they understand goodness). A real theological education won’t let a pastor say those things anymore. 2) For a lot of educated pastors, church growth just isn’t that big of a priority. Part of what a good seminary will do is help you to understand how different faith traditions developed, and why they do things they way they do. If you entered seminary thinking that your denomination was the One True Church with all the answers, and that all real Christians would join it, hopefully you’ll be well on your way to getting over than in second semester Church History. (Obviously, some seminaries just reinforce the party line, but I’ll set that aside for now.) When you come to think that folks are going to be in pretty decent shape whether they come to your church or the church across the street, or just worship at home, growing your particular congregation looks like a pretty narrow and maybe selfish goal. I used to chat with visitors and give them a list of other healthy churches they might want to visit that could be a better fit for them than we were. That probably didn’t always make my elders happy, but it seemed like the really Christian thing to do. Dan points out that the denominations that require an M.Div. tend to be those that have been in decline for a long time, but there’s a chicken-egg problem there. Is the reason that educated pastors don’t grow churches because most of the educated pastors are in declining denominations, or is the reason those denomination are declining because they require their leaders to be theologically literate?